"I grew up in Australia where voting is compulsory. It was something I enjoyed." I'm known as Moist Paula, because of my band Moisturizer. I've been living in the US for over 20 years as what used to be called a permanent resident and is now called a "resident alien." I'm not eligible to vote. I grew up in Australia where voting is compulsory. It was something I enjoyed. In this country, If you have the right and privilege to vote I urge you to vote on my behalf. I hope it will be a fulfilling experience for you. Featuring: Paula Henderson aka Moist Paula - Filmed by: Ginny Suss - Edited by: Aicha Cherif - Song: Sissies by Moisturizer. 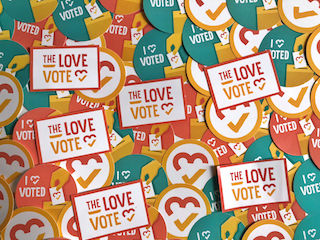 Show Paula love + inspire others + get voting info + get event invites + get stickers + create change!